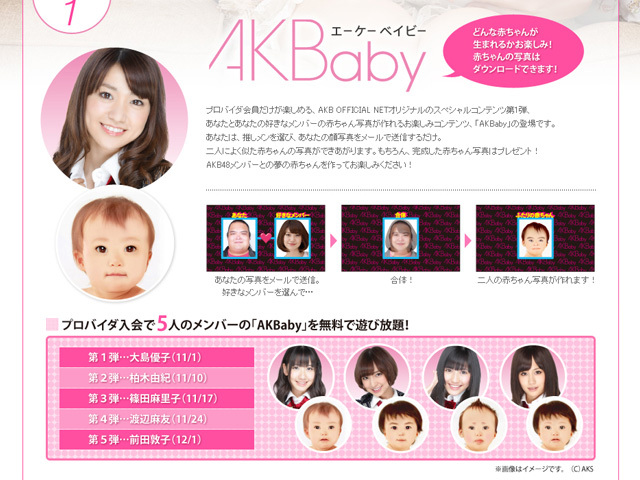 AKB48’s AKBaby – Your future babies with your AKB48 oshimen? Can’t they pick a better picture of a fan to combine with!? They will take over the world. When that day comes ( maybe in 5, 10 years time ) I will tell everyone that I’ve called it. They just kept expanding their influence EVERYWHERE. “Who”, you ask? AKB48 of course. And don’t tell me you’ve never heard of them. If you came here thru Google that means you have an interest in either Japanese Music or Japanese Culture, and yes, I’m pretty sure they’ve taken over both of those as well. If you have even the slightest interest in Japan, you MUST’VE heard of AKB48. They’re like, the biggest thing in the land of the rising sun at the moment. And nothing is stopping them. Nothing CAN stop them. Tomorrow (or shall I say, in a few minutes) they will launch their VERY OWN INTERNET SERVICE PROVIDER. Yes, you heard me right. ISP. A Frickin ISP!!!! I mean, who builds ISPs based on an idol group!?!? And to top that (and also is the main topic of this article), once you’re signed up, you can “make” your own baby with your “Oshimen“ (favourite member). Basically you send your own picture to their system (whatever system it is that they have in place) and it will combine your picture with your oshimen’s, and it will cough up a picture of a baby based on both of your facial features. But thats the hard truth. They’re so intertwined into the Japanese society at the moment, even for people that hate / don’t like them, they will undoubtedly know some of the names of the top girls. Namely Maeda Atsuko, Oshima Yuko, Watanabe Mayu, Takahashi Minami, Jurina Matsui (SKE48), and the list goes on and on. The first two especially are the 1st and 2nd in 2011’s Senbatsu Sousenkyo (Election) and I can safely say that 99% of Japanese will know / recognize their names. Well… I also have a confession to make. Their Iiwake Maybe has been playing non-stop in my music player, both on the way to work AND at work. …and few Youtube videos later suddenly I found myself watching AKBINGO (their official TV series) and digging up their live performances (Request Hour 100) and my latest guilty addiction… I downloaded their latest PSP Game, AKB48: 1/48 Guam de Idol to Koishitara. These girls sell like hotcakes. And that happens for a reason. They’re not as shallow as I thought they were. These girls work their asses off everyday with their daily theater performances, not to mention the popular ones have their own sub-groups (no3B, my personal fave Watarirouka Hashiritai 7, French Kiss) and girls like the Matsuis (Jurina and Rena) performs in both AKB48 and SKE48. People can see this hard-working attitude clearly, and people admire that. I certainly do. They ooze a certain charm, and not just the normal giggly-oh-i-look-so-cutey idol charm that you forget after a few hours of watching other videos. These girls are real performers, real girls that genuinely loves performing and are actually having fun doing that. And they ooze character, every single one of them. From the mature Mariko-sama until the incredibly sweet (but now graduated)Erepyon. Out of the whole 48 (…and more!) of them, I’m 110% sure you WILL find one person that you think is incredibly irresistible, both in appearance and attitude. But first and foremost –if you haven’t liked them already– you just have to shed that thick layer of judgement that you have over your eyes (yes, I DO know you have that. I used to too). Do yourself a favor and try to open yourself to these girls. They can only make your world better in more ways than one. I’ve included some performances / clips / videos that are my personal favourites, hopefully without that screen of judgement over your eyes, you can actually see that these performers really, really does want to be “The idols that you can meet“. From the recently converted, self-confessed Jurina Matsui (and AKB48) fan. Sashihara Rino in Mecha-Ike – I came twice! Yokoyama Yui, Akimoto Sayaka, Sato Sumire & Oya Shizuka got pranked… super hilarious!! AKB48, JPOP, Live Performance, Music Video.